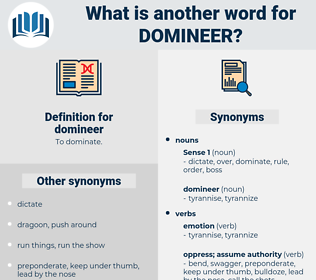 What is another word for domineer? wear the pants or trousers. follow, surrender, serve, help, yield, leave alone, assist, submit. The effect of this belief upon a nature like hers was to increase its natural arrogance and her tendency to domineer, while the strange, extravagant personal conceit which seemed so at variance with her practical nature became a paramount trait. 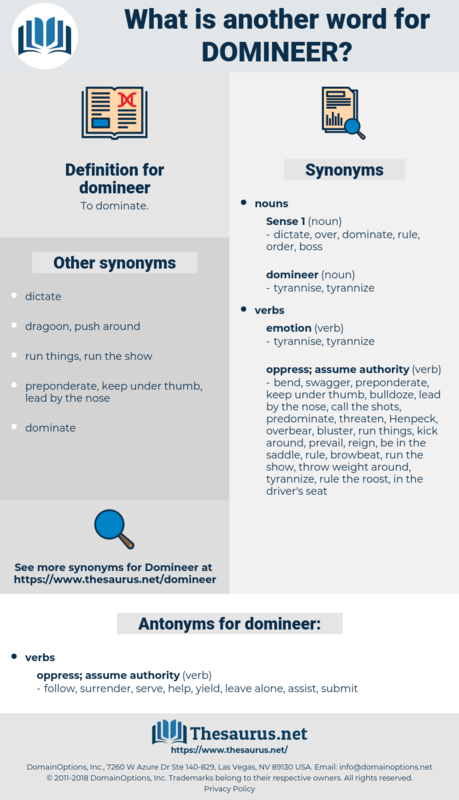 demeanor, dinero, diner, deanery, downer, demurrer, dimer, demeanour, donor, dinner, damar, denary, De Niro, demur, demure, denier, donar, demerara, dinnerware, Du Maurier, dammar, dimmer, dinar, daumier. boss around, push around, bullyrag, browbeat, strong-arm, bully, ballyrag, hector.